Kevin Garnett has a big mouth. I blogged about it a little the other day. No more than a passing mention, it nevertheless got a big reaction. All kinds of e-mail and comments flooded in, with strong emotions on all sides. Apparently I had stumbled across one of the NBA's emotional trip wires. My assumption has always been that Kevin Garnett is no different from the loudest guy at your pickup game. What he says means not too much, in the big picture. But maybe there is more to it. I come from a neighborhood where you can say what you want to say, but 'til you do something, it don't mean nothing. Some of those guys are happy to get a ring, but you ain't been in the league long enough to talk to people like that. I don't have a lot of respect for that. Like I said, I'd be curious to hear what they have to say in a different setting, I'd be very curious to see that. In this view, Garnett's screaming could be seen as the funny-looking sidecar hitched to the turbo-charged motorcycle that is his passion. It's a great package. But maybe the motorcycle could be improved by ditching the sidecar? I don't think he's crossed any lines. KG is in the same category emotion-wise as Terrell Owens. Those two guys play with such emotion that some people mistake it for being boastful or arrogant. KG wears his emotions on the outside, some players show it differently. People just aren't as used to it. I'm not sure aggressive is the right word so much as surreal, especially in the case of that treeing-Jerryd-Bayless moment. There are different types of trash talk, and that was a far cry from the kind that Jordan and Bird employed -- you know, with a purpose, as part of a mind game, often playful. It's as if, after winning a title, Garnett's finally given himself license to go totally primal whenever the urge strikes. ... But if this is the price that must be paid to see Garnett at full intensity -- and I'm not so sure it is, but I suppose it's possible -- then it's a price I'm willing to pay. 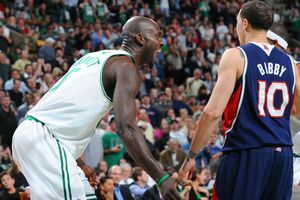 One typical story is of a rookie from another team, a few seasons ago, attempting to make small talk with Garnett in a meaningless game at the end of the year. The player had grown up admiring Garnett, but the veteran told him in no uncertain terms that he did not want to hear from any such rookie. I always found it, let's say, quirky that Garnett would have these dust-ups with some of the most unlikely combatants. Guys like Andrew Bogut (no offense but not yet all-NBA), Mark Pope, Joel Przybilla, Rick Rickert (in a summer pickup game), Wally Szczerbiak, Francisco Elson, Tyrone Nesby, Anthony Peeler. The list doesn't exactly read like an All-Star roster, which then makes people wonder if he is more likely to bully a fringe guy than he is to take on one of his giants-of-the-game peers. Some growling or staredowns with fellas such as Tim Duncan and Amare Stoudemire through the years, but nothing approaching flailing, skirmishes or donnybrooks. No doubt it stems from some sort of passion, but it also seems to pack an element of umbrage taken when some mere mortal gets on his cloud. It would be nice if he would cool it. 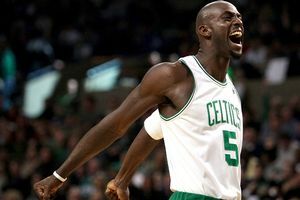 One view -- and it seems to be the default view among Celtics fans -- is that Garnett's passion is the fire that galvanizes the Celtics and forged a champion, and that his mouth is a key to the passion that drives his team, the league, the companies that he represents, and the sport itself. Never underestimate the level of sophistication of the professional athlete. While some may consider Kevin Garnett's antics to be over-the-top and reckless, I think they are intentional and part of his basketball psychology: to motivate and inspire his teammates and himself, and to disorient and annoy his opponents. This basketball psychology is a large part of why Kevin Garnett has had years of success at this level, and why he has been able to maintain an incredible level of intensity and consistency for over a decade. Ask anyone who has played with him and they will tell you he is a great teammate. Ask anyone who has played against him, and they will tell you he is a fierce competitor. The tired complaint against pro athletes is that they "just don't care" or are in it "just for the money." Now Kevin Garnett is under fire for caring too much?!? Do people really believe this? What color is the sky in this alternative universe? I want players to slap the floor with their hands, shoot daggers with their eyes, and bang the ball against their heads. That's what we did on my NYC High School team because we gave a damn something fierce. I'm sure an 82-game season is an unholy grind. But it's our privilege that we have a player who acts like it's anything but. A decade ago Garnett warned us that it wasn't about "the loot." We should have listened. ch thrives on shutting down players who attempt to do everything themselves. In fact, it is only supremely unselfish teams, who can make quick passes from one side of the floor to the other, that can penetrate their defense. When one player is so focused on the "me against him" battle with KG, it gives their defense a helping hand. I think the normal reaction to a situation like this [emotional player on another team drawing the ire of everyone outside of that particular team] is to say "well, you'd like it if he was on your team" ... call it the "Manu Ginobili Response." And in some ways it's true: many teams wish they had an aggressive, vocal leader to rile up the troops and get under the opposing players' skins. That being said, Kevin Garnett this year goes above and beyond that threshold. Crawling on all fours, clapping and pointing in a player's face as he dribbles up the court ... these antics are classless and have no place in our game. If Dikembe Mutombo can get T'd up for a finger wag (or a player who dunks on Mutombo can be T'd for wagging a finger back), where do you classify what Garnett did to Calderon? The fact that the Celtics won the title last year (and continue to be the cream of the league this year) should not change the fact that what has been going on is unacceptable. As a league, we have certain guidelines and parameters for professionalism and sportsmanship, and these guidelines are not dictated by a team's record. I'm not saying get rid of all trash talking; basketball is a competitive sport, and letting those competitive juices fly on the court is a good thing. Passion for the game is a good thing. Being a complete jackass is not. One Eastern Conference executive explained to me that Garnett's mouth gets him in trouble now and again. He has both argued and fought with teammates (last week he apparently reduced Glen Davis to tears), actions that potentially come with costs to the team's cohesion and success. But, he argues, you accept that, because it is indicative of his extraordinary passion, and because he puts forth such tremendous effort. Complaining about Kevin Garnett's mouth, he says, is like quibbling with the lipstick on a supermodel -- it misses the big point. The time Garnett's mouth really gets in the way? This expert says it's about the only thing that keeps Garnett from being the ideal role model for young players. He looks right at home in that adidas video, talking to teenaged players. Of course everyone from high school big men to NBA rookies should study all kinds of things about Garnett. How he defends the pick and roll (love that fearlessness containing faster guards! ), how he fires up his teammates, how his motor runs high at every moment ... in a these and a thousand other elements of the game, he is essentially perfect. In how he talks, however, Garnett really is not to be emulated. That's not the most important thing in the world. But it's not nothing, either. Like presidents, players tend to start worrying about their legacies at some point. And in that, having young players looking up to you might start to matter. Through it all, I remain unconvinced that Garnett needs to verbally abuse people to play basketball well, just as I remain convinced that there is tremendous value, in all walks of life, in treating others with dignity. Does that mean I'd be happy if Kevin Garnett toned it down? Honestly? I can't say it's that clear cut to me. Yes, he's rude. KG-5 is not PG-13. (I dare the NBA to mic that guy all night long.) The way he uses his voice is the kind of behavior that would get you kicked out of many pre-schools or fired from many workplaces. In almost any social setting, this would be considered somewhere between petulance and bullying. That doesn't mean I want those social standards applied here. Sports are special. On the playing field, certain kinds of immoderate behavior are, thank goodness, not only welcome, but helpful. Kids who aren't supposed to jump on the couch, throw things, or run too hard in the living room are supposed to jump higher, throw things harder, and run faster in sports. So all NBA players ought to have a certain leeway. And if Garnett goes even beyond that ... I wholly believe in the rule of doing things the right way. I also believe that sometimes, you break those rules, too.